The stands were packed Saturday for the final night of the Crooked River Roundup Race Meet. After record crowds on Wednesday for ladies night and another good crowd on Thursday, hot weather on Friday kept the crowd down a little. However, Saturday more than made up for that, as despite the hot weather, the grandstands at the Crook County Fairgrounds were once again packed. 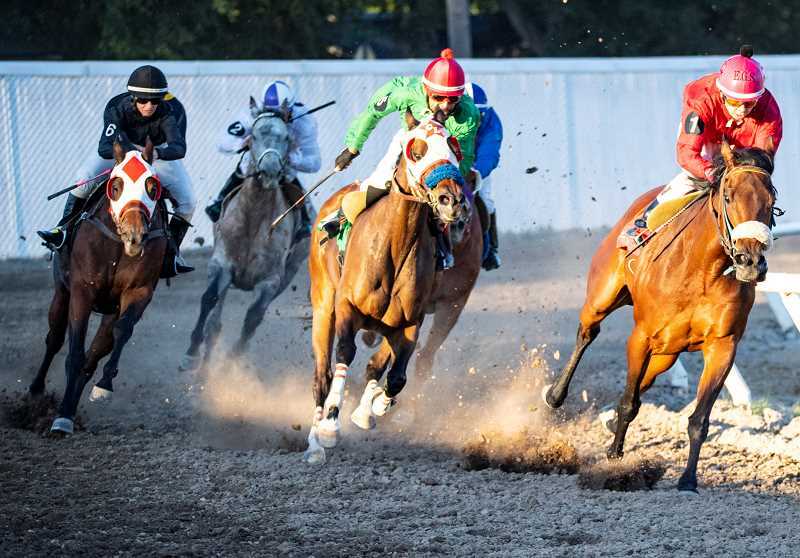 "Friday was pretty hot, and I think that because of the weather people shied away a little bit on Friday, but not by much because our numbers were consistent with the past in terms of our handle," race meet director Dean Noyes said late Saturday night. "But we are making up for it tonight. We have a huge crowd." Noyes added that betting was good all four days, not only at the track, but on the simulcast, which allows for off-track betting. 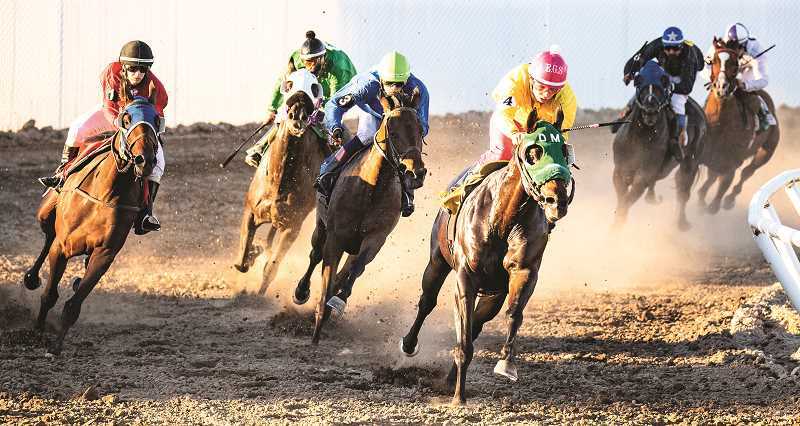 "Grants Pass and Prineville are the two fair tracks in the state that have made the investment in simulcasting in order to increase our exposure and broaden our handle," he said. "It gets our name out in other markets. It just compliments our live betting, and it exposes our race meet to the world. That's the bonus of it, it doesn't do anything to pull away numbers from us. It just adds with people betting in Vegas and New Jersey, and everywhere." With off-track betting increasing the handle, the Crooked River Roundup Race Meet has seen a steady increase in betting in recent years. Although the final totals weren't in yet at press time, it looks like the 2018 race meet may have had another record handle. Noyes said that the race meet is only made possible by the hard work of volunteers, proudly noting that this year's race meet had more than 120 volunteers. The volunteers range in age from retired individuals to teenagers, with people working on the track, at the gates, in the betting windows, as well as a large number of individuals who work behind the scenes who aren't generally seen by the public. "It's the city of Prineville and all the people that take on the amount of work necessary to put this track together," Noyes said. "There are over 120 volunteers on the grounds that put in countless hours." In order to recognize some of the long-time volunteers, the race meet has started honoring specific volunteers following races. Wednesday night, the race meet recognized Jerry Bernard and the rest of the Bernard family as three generations of Bernards worked at this year's races. Then on Thursday, the race meet honored Dan Severance and the Severance family, which also has multiple generations of family members working at the races. "We do it as a surprise," Noyes said. "We don't announce it ahead of time because our patriarchs, like Jerry (Bernard) and Dan (Severance), that's not what they are doing this for. They don't do it for the recognition. It's not a memorial race, but it's an appreciation race." Just a few years ago, the race meet struggled to get enough jockeys to run the meet smoothly. If a jockey left or was injured, then in subsequent races, a horse might have to be scratched from a race because of a jockey shortage. That is no longer a problem, with more than enough jockeys at the race meet to cover any eventuality. This year's race meet had 11 full-time jockeys as well as a couple of apprentice jockeys riding during the four-day meet. Noyes credited the Oregon Horsemen's Benevolent and Protective Association (OHBPA) with the improvement. "Randy Evers with the OHBPA did a great job with that," he said. "That group spearheaded a campaign that we all met in Portland to try to figure out what the jockeys were looking for in terms of recidivism because they were looking for certain things. I think that this program is the best that we've ever had. We haven't had a problem with jockeys since this happened." Noyes noted that a core group of sponsors have helped the race meet increase purses over the last couple of years, which has helped to attract more horses as well as keeping more jockeys involved. Between the additional money for purses, an increased number of jockeys at the race meet, the use of simulcasts, and the hard work of volunteers, Noyes said that the race meet has never been more healthy. Jose A. Figueroa was named the jockey of the meet after winning eight races, placing second in two and third in nine races during the four-day race meet. Horses that Figueroa rode earned $24,948 in purses. Jose A. Guerroro was nearly as successful, winning seven races, placing second in four, and third in four more as horses he rode earned $22,188 in prize money. Eduardo Gutierrez-Sosa also had a successful race meet, winning five races, taking second in four, and third in 10 as horses he rode earned $21,570. Nine other jockeys won at least one race during the four-day event. Bob Lawrence was the race meet's leading trainer. 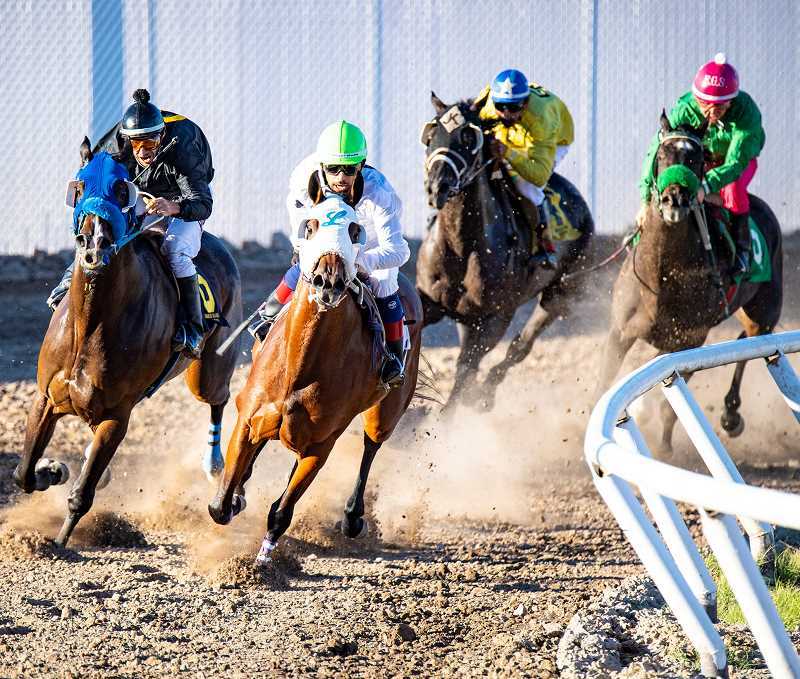 With horses making 14 starts, Lawrence trained horses won four races, earned one second, and had seven thirds, picking up $12,563 in prize money. Eight other trainers won two races, while six more won a race. Jim Craig was the leading owner, with horses making four starts as he picked up two wins and a third. Deadpool Racing, Crispin Ramirez, RTM Stables LLC and Robin D. Dunn also each won two races. Saturday races saw Feature Mrs. Bo, ridden by Figueroa, win the Prineville Quarter Horse Futurity, running the 250 yards in 13.547 seconds. In the race with the highest purse of the race meet, For Sweet Jess, ridden by Robert Burney, won the Jack Rhoden Memorial Bonus Challenge, running the 250-yard quarter horse race in a time of :13.236, picking up a purse of $7,535 for first place. Mals First Down, ridden by Gutierrez-Sosa, was second with a time of :13.246. The Natural, a 7-2 longshot, won the Art Smith Memorial race as the thoroughbred horse raced the seven furlongs in a time of 1:29.80. The horse ridden by Figueroa earned $2,805 for its effort. Rictac Man, ridden by Jamie E. Lopez, won the mixed breed Crooked River Hook. The quarter horse picked up the win when He's a Bugin, ridden by J. Jesus Afanador, was disqualified. Rictac Man covered the 610-yard distance in :32.832. Megatron Ruler, ridden by Gutierrez-Sosa, won the Ben Woodward Memorial Stakes, covering the 5 and one half furlongs in 1:07.40, while in the final race of the meet, Gray Flyer, also ridden by Gutierrez-Sosa, won the one and one eighth mile Prineville HBPS Stakes with a time of 2:02.40. "We had a couple of hiccups on Wednesday at the betting windows," Noyes said. "There's a learning curve for our volunteers. Then all of a sudden, people just get better and better every day, and by Saturday night, it's all put together. It's just exciting to have so many people help us out, and this was another amazing year."